Measuring from the ground is a technique not widely known outside the JBS Roofing profession. While the idea of measuring a roof from the ground may seem absurd, it is possible to get enough information for accurate measurement without ever setting foot on a ladder. Obviously, measuring from the ground eliminates the risk of falling from your roof. The methods below can help you to measure an entire roof from the ground and to order your materials. You can get an approximate measurement simply by counting the number of shingles from left to right. This gives you the width of the section in feet since each tab on a three-tab shingle is roughly 12 inches by 6 inches. The next step is to count the shingles between the gutter and the roof’s peak and divide the number by two to get the height. Multiply the numbers to get the square feet of that particular rectangular section. 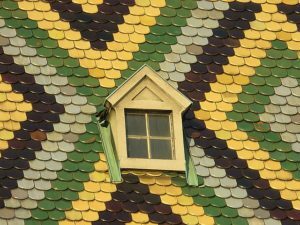 If your home has triangular roofing sections such as dormers, count the shingles from left to right at the widest point and then from the gutter the peak of the roof and multiply in the same way. The resulting number will be more than the actual number of shingles but is acceptable since the triangular sections only make up a small fraction of the roof area. The first thing you need to do is to measure your home’s perimeter with a measuring tape. Measure the length and the width and multiply them to get the area of your home’s floor level in square feet. If your home’s floor plan is a complex one that consists of several rectangular sections, you will need to find the areas of those sections individually and add them together to get the total area. You will then want to convert the total area to roofing squares. To do this, you will divide the total area by 100. 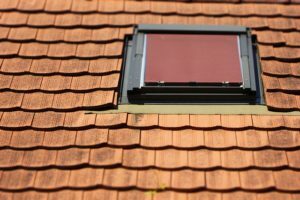 For example, a 2,000 square foot home would have a surface area of 20 roofing squares. The calculation of pitch is an area with significant potential for error, especially with a more complex roof style. It involves converting your measurement of the area to a three-dimensional one that accounts for the roof pitch. Start by determining the pitch of your roof. The three general categories of roof pitch are low, medium and high. A low roof with a low pitch would have no less than a 3:12 pitch means that the roof elevates by 3 feet for every 12 feet of horizontal length. Generally speaking, a roof with a low pitch will not go above 5:12. To calculate the roof measurement with this type of roof, you will need to multiply the number of roof squares by a number between 1.15 and 1.25. The actual multiplier depends on the steepness of the pitch. A medium pitch roof will be between 6:12 and 9:12. The multiplier here will be between 1.25 and 1.4. Roofs with a high pitch will have a slope that is more than 9 inches for every horizontal foot, which means that the multiplier will fall in the range between 1.41 to 1.7. Multiply the roofing squares by the multiplier to get the size of your roof in roofing squares.